Our family friendly set provides our most requested assortment of cookware in the sizes most useful and practical for the average family. These four pieces with two lids possess sleek, modern stainless steel handles for a contemporary appearance and cool to the touch comfort, while the brushed surfaces are easy to care for and a feature exclusive to Falk Culinair. 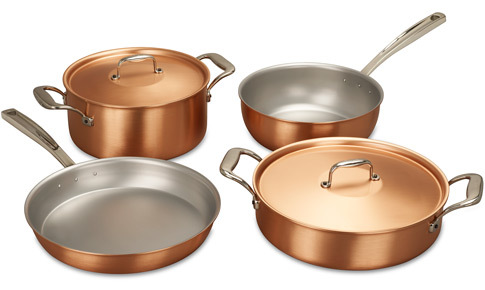 The highly conductive nature of copper ensures even heat distribution and accurate temperature regulation. The hygienic stainless steel linings, which are permanently bonded in a process patented by Falk, assure you of pure, intense flavour. Best of all, every one of our sets includes a generous multi-piece discount!